When you need to carry out a deep clean but are running low on cleaning supplies, a mad dash to the supermarket can be pretty daunting. It’s unbelievable how expensive some cleaning products are… and are they worth it? You often have to choose between half a dozen products all claiming to do the same thing ‘only better’ than the competition and this can lead to cupboards full of half-used cleaning products, not to mention empty pockets. We think it’s unnecessary to stock up on gaudy canisters sporting glitzy slogans promising you a show home in just a few sprays! The likelihood is you already have everything you need for a good, deep clean in the cupboard and, best of all, they’re non-toxic and affordable! White vinegar is one of the world’s best-kept cleaning secrets! Its acidity is no match for many types of grime, dissolving soap scum, limescale and residual adhesives with ease. It’s also a fabulous disinfectant. Cleaning grout – dip a toothbrush in vinegar and scrub grout in circular motions. Clogged drains – create a concoction of one part baking soda and two parts vinegar… and prepare for fireworks! It’ll fizz up very quickly, breaking down clogged hair and other debris. Flush through the debris with lots of clean water, and rinse and repeat until drains are fresh. Mirrors – for shiny mirrors, use a mixture of vinegar, warm water and a good buffing towel to give your mirrors a streak-free sparkle. This humble store cupboard staple is handy for tackling tough dirt, especially from burnt-on grime from cooking and stubborn stains. Cookware – a sprinkling of salt prior to scrubbing/putting in the dishwater helps lift stains with little effort. Try it to remove ‘heavy’ sauces, sauce as pasta sauces or chili con carne. Tea / coffee stains – create a paste of salt, vinegar and lemon juice and work into the mugs to brighten up in no time. Cutlery – a similar mixture of salt and lemon juice can restore shine to knives and forks, even metal tools with light rust. Another store cupboard stalwart, bleach is a really useful multi-purpose cleaning chemical and super cheap to buy. Show us a premium cleaner and, in most cases, bleach does the job just as well! Don’t pass it over just because it’s an ‘old fashioned’ cleaning product. Top tip – with bleach ‘less is more’ so it lasts really well too, making it even better value for money. Sponges – don’t throw out kitchen sponges and cloths after a deep-clean; sanitise them by soaking in a bowl of warm water mixed with a dash of bleach. Toilets – when it comes to the loo, pour a good glug of bleach into the bowl and leave for up to thirty minutes before going to town with the scrubber to ensure germ-free tinkles. Children’s toys – little hands carry many germs and an occasional clean with a weak bleach, dish soap and warm water solution will neutralise the nasties. Thoroughly rinse toys afterwards and give plastic toys a tour through dishwasher if possible. Hear us out! While you may be more accustomed to dousing your chips with tomato sauce, it’s a handy go-to for cleaning too. Why? Well, it’s all to do with the salt and vinegar content of the ketchup – and we’ve shown you what they can do above! Kitchen sink – remove scratches and scuffs from a metal kitchen sink and drainer by applying ketchup liberally to the affected area. Using a soft cloth, give the marks a good rub. It’ll probably take a few attempts of rinsing and repeating, but you can remove what looked like permanent marks with a little elbow grease. Naturally acidic, the juice of lemons and other citrus fruit have antibacterial properties – think of it as nature’s bleach. In addition, the crisp, clean scent of lemon makes it a great freshener, much cheaper and healthier than synthetic supermarket fresheners too! Bins – bins can get very smelly, especially in the warmer months, but heavy duty cleaners can be oppressive and cause headaches. Instead, drop some lemon juice down the drain and into your kitchen bin to reduce unpleasant odors. 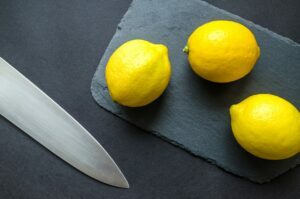 Cutting boards – get rid of stains and funky smells on your cutting board by squeezing lemon juice onto it, leaving to absorb for twenty minutes and rinsing for a fresh finish. PLEASE NOTE lemon is not a disinfectant so you will still need to sanitise your boards in the regular way. Bread just isn’t a satisfying accompaniment to baked beans, butter or raspberry jam; it also makes a great companion tool to many household jobs! Broken glass – carefully pick up the large pieces and sweep up the smaller ones, then gently press a piece of white bread into the accident zone to collect the ultra fine particles that can still give a nasty cut. Artwork – using no other products, sweep a piece of bread softly over paintings and other art pieces in the home to sweep away dust while keeping bright colours and details in tact. So, now you’re well equipped to get going on the cleaning but, like us, do you need a snack first?